West Bank - Rabbi Michael Mark, 48, a father of 10 and the director-general of the Otniel Yeshiva was killed Friday by a Palestinian gunmen as he drove on Route 60 in the South Hebron Hills. Mark was driving with his wife, Chava Rachel, who is in critical condition, and his daughter Tehila (14) and son Pdaia (15), who were also injured in the shooting. Miki and Chava Rachel’s eight other children were at home during the incident and were notified of their father”s death by the authorities. 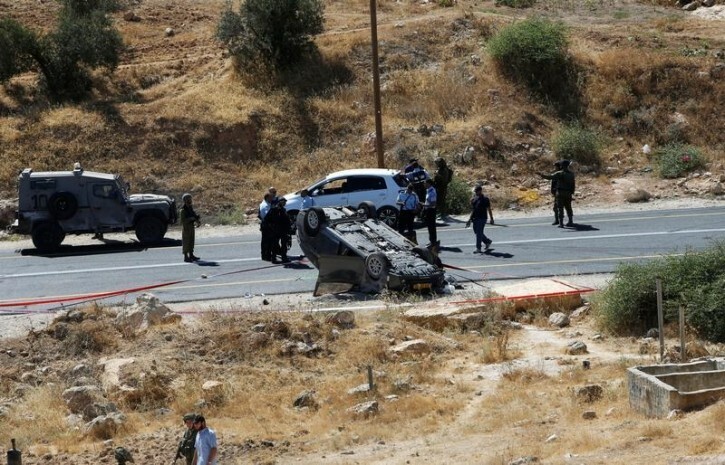 The junction is located just 15 kilometers down the road from the Kiryat Arba settlement, where a Palestinian terrorist infiltrated a home and stabbed to death Hallel Yaffa Ariel, 13. In Friday’s incident, the rain of bullets against the vehicle caused it to overturn. Paramedics who arrived at the scene found Mark in the upside down vehicle, while the other passengers had been thrown out of the car. Magen David Adom paramedics reported that Mark’s wife, in her 40s has been evacuated while sedated and intubated, and rushed to the Hadassah Medical Center in Ein Karem in serious condition. His daughter, 14, sustained with a gun shot wound to her stomach is in serious condition and his son, 15-year-, was lightly injured. another day, another good Jew killed due to the Zionists govt weakness and care more for the UN and Obama than jews. Settling Otniel, Chevron, Elon Moreh and all the rest of these far flung communities embedded among the Arabs, is NOT worth destroying even onr precious family. Nebech. Unfortunately the security situation in all of Israel now is such, that we can't pretend that it's business as usual and just go for a ride without the proper protections and precautions. Meaning fully armed passengers and armored vehicles. Scoff at my comments as you will. Living in Kiryat Arba and these types of communities is very different than pulling out of Gaza and having a buffer zone. Nobody said that the Arabs aren't animals - but still , parents who take their children to live in these war zones among the vicious animals (just for the sake of settling the Greater Israel) are, in large part, guilty of killing their children. It's about time we put Jewish blood before settling the land. I question if this comment was written by a rachman ben rachman. A yiddishe neshomo was just taken away from us leaving behind 10 yesomim- how can you possibly respond so callously?!?! And as for danger- can you really say the Shomron is any less safe then Tel-Aviv? Yerushalayim? Orlando? San Bernedino? Refuah shleima to the mother and two kids and my deepest condolences to the mishpacha. Your moronic statements are only getting worse. You're actually blaming the IDF and the "Zionists" for this atrocity? Without them there would be another shoah, this time in HaEretz. What are you doing to protect EY Yidden, sitting in your chair behind your computer, safe and sound? Twirling your payess? Yutz. It does not matter where you settle. The arabs will hate us anyway. They will exploite any weak area to murder jews. Living in far flung communties does not contribute a blasted thing. When we pulled out of Gaza we lost more lives. Please continue to live in these far flung neighborhoods. Still don't know why Israel doesn't have the death penalty for terrorists who murder! Story after story after story...bottom line is if you live in a cage with a snake you will get hurt. Living in the west bank especially near these sub human islamic murderers is suicide! Its a fact! I don't care what you will all say and rant but it's a damn fact! You cannot live side by side with murderers and pretend that everything is ok by being mafkir you and your entire family. Now yell back! It is a well known statement ''ha ba le horegcha hashkem l' horgo.--when one comes to kill you ,arise early and slay him first. the leaders who are telling folks to kill jews must be ELIMINATED. The LEADERS of the IDF are responsible Yaalon, Eisenkot etc, as they tied soldiers hands and yes the govt is even more negligent. Kahane had a solution to all this. The Zionist government is negligent, can you imagine what would happen if we had Putin instead of BIBI? it's our land, you idiot. “ I question if this comment was written by a rachman ben rachman. A yiddishe neshomo was just taken away from us leaving behind 10 yesomim- how can you possibly respond so callously?!?! To explain, that disgusting comment was made by "thetruthis" (who wouldn't know truth if IT fell over it), a known Neture Karta lowlife. How would that help when the terrorists glorify death and ready to die for their "cause" of supposed paradise for killing Jews r"l? The internet has proven what kind of people are really out there. Especially#5. Wow. The parents are now guilty. You make Arafat look good. I think this whole stream should be closed. Maybe the rest of the world will not see how much Jews hate Jews. "guilty of...". What a horrible,despicable thing to say. 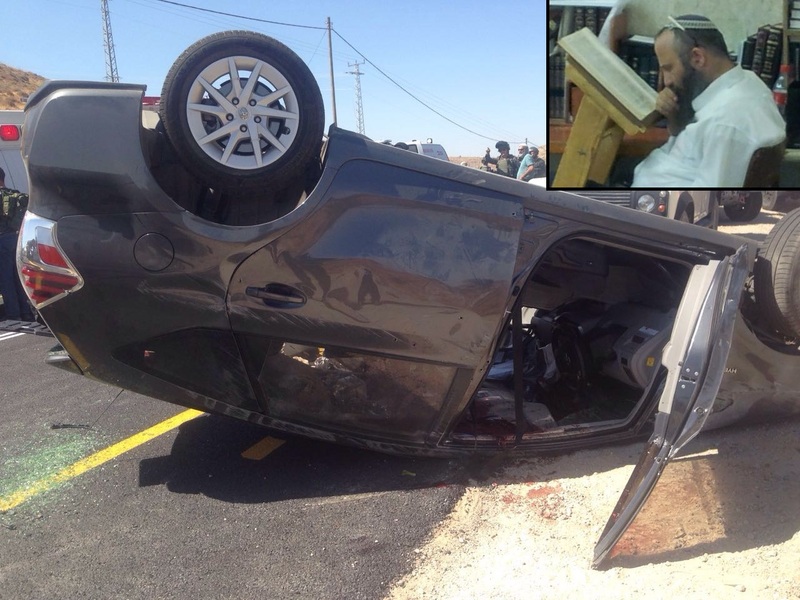 Who's responsible when an Arab kills a Jew r'l in Yerushalyim? How ridiculous! On Thursday there was a stabbing attack in Netnya, recent attack in Tel Aviv and probably many incidents that never get to the media so as not to cause panic to the residents. Look at a map- either we have them amongst us or on the sidelines. And they want us dead, including those who kiss them and demonstrate for them. Make no mistake. Takeh, you're right. However, the Palestinians don't think so and they're bloodthirsty animals willing to kill over it. I say that jewish blood is more important than Jewish land. And stop with the moronic responses of kill them all, wipe them out etc. It's not going to happen. We will just continue to see jewish lives lost over a piece of land. Disgusting. The low information vosizneis commentator have alot to say, I see. The truth is that this loss of life was spelled out by chazal as punishment for doing exactly what the settlers are doing. Tzvi Yehuda Kook was in the forefront of allowing people to endanger themselves for the sake of settling every inch of EY. L'maisah he and his talmidim are responsible for these deaths. Yelling about Neturei Karta is just a way of avoiding the truth. Educate yourself. Ignorance is never healthy. He IS suggesting that Jews should leave. All of Israel!!! That's because the lowlife "thetruthis" is neturei karta scum! “ Takeh, you're right. However, the Palestinians don't think so and they're bloodthirsty animals willing to kill over it. I say that jewish blood is more important than Jewish land. You're the disgusting one! Now out yourself, coward! Are you a "Torah true Jew/NK?" As if we don't know, and as if you'd have the courage to actually TELL the truth!